A Hexer in The Lost and Damned. The LCC Hexer is a chopper style motorcycle originally existing in inactive game files in Grand Theft Auto IV, and featured proper in the The Lost and Damned, The Ballad of Gay Tony, Grand Theft Auto V and Grand Theft Auto Online. The Hexer is a "modern classic" chopper-style motorcycle built by Liberty City Choppers, distinguished by its basic tube frame design and elaborate rake construction. The bike comes with two types of color schemes encompassing the frame, gas tank and rear fender, either featuring a one-tone body color, or a two-tone black-and-white stripped scheme. 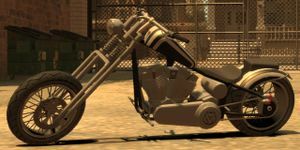 For the unfinished GTA IV version, the bike features a differing gas tank and rear fender paintwork that persisted halfway into the development of TLAD. As a whole, the Hexer is based on a West Coast Choppers CFL. The Hexer is Johnny Klebitz's premier choice of transportation featured prominently in the game's trailer and screenshots, possessing superior handling and a unique white-and-blue color scheme (an inversion of a regular Hexer's black-and-white scheme). As stated during the introduction of the player's bike following "Clean and Serene", Johnny's Hexer is a one-of-a-kind bike with a 2032cc twin cam engine coupled to a 6-speed transmission with a chain final drive. An early Hexer in Grand Theft Auto IV. TLAD game art of Johnny Klebitz depicting a work-in-progress Hexer with a backrest and a different exhaust pipe design. Johnny Klebitz's uniquely white-and-blue Hexer in The Lost and Damned. Despite its image as the bike of choice for The Lost and Damned's main character, the Hexer's overall performance is otherwise average, with a mediocre top speed of around 125 kph/77 mph, average acceleration, average steering (being able to occasionally handle corners with the throttle applied), good grip around corners, and average brakes. The bike's length also makes it slightly less easier to steer, often requiring the aid of its brakes or emergency brakes to execute sharp turns. It is particularly challenging to use a Hexer in chases where drive-by shooting is required, such as in "Diamonds in the Rough" where the game automatically replaces whatever bike Johnny was riding (even superior bikes such as the Bati 800) with the Hexer. There are no noticeable performance differences between Johnny's Hexer and any regular Hexer. The default radio stations of the Hexer is Liberty Rock Radio 97.8 in The Lost and Damned, and Vladivostok FM in The Ballad of Gay Tony. Because the vehicle is intended to be a "one of a kind" bike, the Hexer does not commonly spawn in traffic when the player rides one in TLAD. However, the Hexer in TBOGT may spawn in traffic under this condition. Johnny's Hexer is actually blown up in "Shifting Weight" in TLAD but is implied to be repaired by Clay Simons after. If Johnny's Hexer is sunk in TLAD, the bike will unusually start up again once pushed out of the water. Used during most missions, the player can find Johnny's Hexer by loading a save file and going outside, where it will be waiting near the parking lot at both the Lost MC Clubhouse and Brian's safehouse, or when the player begins a mission which requires the Hexer but has driven a different vehicle to the starting location. Despite being described as a unique bike, the player can find regular Hexers ridden in parts of Algonquin and Bohan. The player can request Clay Simons for a regular Hexer to be delivered to the player, after "Clean and Serene". Can be spawned with a cheat code by entering the number 245-555-0150. Johnny's Hexer will also spawn if you scroll through the colors. Widely available in the multiplayer modes. Johnny's Hexer is available in the mission "Not So Fast", however his bike is "locked" and the player character refuses jump on the bike. One way to obtain it is by using the Fire Truck's water cannon to move the bike to the closest safehouse. Occasionally spawns being ridden around the Stab City area of Blaine County by Lost bikers in groups of three. Also frequently parked, usually unattended, amongst the mobile homes inside Stab City itself. Frequently spawns inside The Lost MC clubhouse grounds in East Vinewood. Acquiring one here, especially if playing as Trevor Phillips, can be risky as many Lost MC bikers spawn here and may attack the player. Occasionally spawns parked in the Hookies parking lot in North Chumash. As with The Lost MC clubhouse, acquiring one here can be risky because Lost bikers may attack the player. Rarely spawns being ridden by Lost bikers on Route 1 near Paleto Bay. This page was last modified on 6 March 2014, at 05:25.